Without the threat of predators and with food provided, it's easy to imagine they would just stand on one leg, snoozing. But research by the University of Exeter shows captive flamingos do more foraging and roam more widely in their enclosure at night than in the day. "For lots of species housed in zoological collections, we know little about what they do once their keepers go home," said Dr. Paul Rose, of the University of Exeter. 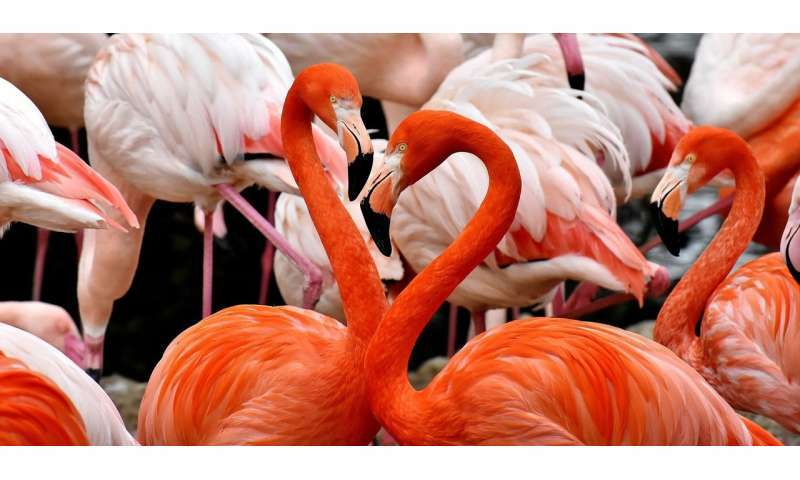 "Wild flamingos are more active at night, and we were surprised to find the same is true in captivity. "It seems they have an in-built behaviour pattern to keep active. "This research has important implications for how we manage zoo populations of flamingos and other species. "By providing a habitat that allows a range of activities to be performed – including some we don't see them doing in the daytime – we can allow them to behave in a natural way." More research into nocturnal behaviour is needed if the welfare of captive animals is to be fully understood, Dr. Rose says. This study used remote trail cameras, fitted around the enclosure of a large flock of about 270 greater flamingos at WWT Slimbridge Wetland Centre. The results showed flamingo foraging peaked in the evening, meaning this natural timing persisted despite the fact the birds were provided with a complete diet in the daytime. Flamingos roamed most widely in their enclosure during the later evening, middle of the night and into the early morning. Birds congregated in fewer areas of their habitat during the later morning and middle of the day – preferring to be in one specific place for resting and preening. Some behaviours, such as courtship displays, were most commonly performed during the day. The paper, published in the journal Zoo Biology, is titled "Patterns of nocturnal activity in captive greater flamingos." Are flamingos returning to Florida?